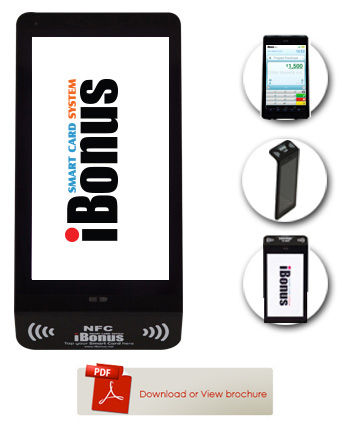 We have also marked our presence in the world of technology with the launch of iBonus Android Terminal. It is one of the latest and advanced smart gadgets (android based) that is specifically used for loyalty/ Prepaid applications. This program will automatically function as loyalty terminal if the application licensed is installed successfully in the gadget. After the advent of iBonus Android Terminal many users are enjoying several benefits as it not only reduces the bulky static terminals, but also functions as an intelligent, smart and user-friendly technology in accordance to the latest trends. To use this application you simply require an android based Smartphone or an android based tablet PC that supports the features of NFC. Once it is installed you can easily access the data and other details of your customers including, balances, points, rewards and much more. Being a leading service provider of loyalty solutions, iBonus Limited has masterly designed a customizable Tablet PC with pre-installed iBonus Application. This is a revolutionary device that can be used by all members for different purposes, from processing the transaction to checking the transactional reports and much more, anytime and anywhere. Being a mobile POS system, it functions as a point of sale terminal for users. Unlike traditional Point of Sale Machine which is stationary and fixed at a place, this android based tablet PC is transportable that is intended to offer you the comfort and ease of use as it is portable and can be carried anywhere along with you. This innovative gadget is designed to reduce the cost involved in the process of maintaining huge backend servers to use smartcard technology. This is an advanced terminal that reads the smartcard automatically and even the last point balance that is stored in the card, whether connected or not to internet. This terminal is masterly crafted to store over 5000 records in offline mode and the stored data can be transferred easily to the cloud server as it is based on cloud system, thus preventing you from having a huge and expensive IT infrastructure for storage of data. Users can easily combine this advanced smart terminal with their existing POS and our dedicated team is always there to provide you all necessary supports throughout the process. They will not only help you to learn the process of using the smart terminal, but also help you to install and integrated the terminal with your existing POS without much effort. Application S/W Google play store, Android market, Facebook, MSN, Skype, Twitter, QQ, Etc. Video MP4/MKV/PMP/MPEG2.3.4/ SP/AVI(XVID,H.263,DIVX)/Flash11.1/3GP/RMVB, All video format. Port Support TF card and USB2.0 High-Speed.